A bomb ripped through a Shiite Muslim mosque in Karachi during evening prayers Monday, killing at least 16 people and wounding 38 others. A top Pakistani official said the blast could be revenge for the assassination of a senior Sunni cleric. Hundreds of Shiite youths rioted after the explosion at the Imam Bargah Ali Raza mosque, which came a day after unidentified gunmen killed the Sunni cleric, Nazamuddin Shamzai. The explosion was the latest in a series of terror attacks in Pakistan's largest city. It was not clear yet if it was the work of a suicide bomber. Police fired tear gas trying to disperse the rioters, who torched two police vehicles and a gas station and ransacked two government offices, stealing furniture and burning it at a traffic intersection. Gunshots were heard, and police officer Gul Hameed said six people were wounded. Interior Ministry spokesman Abdur Rauf Chaudhry told The Associated Press that the bombing "could be a reaction to" Shamzai's slaying, which triggered riots Sunday across this eastern city and stoked fears of more sectarian violence between Sunnis and Shiites. The blast cracked walls, destroyed an inner office and badly damaged a room where people wash up before praying at the mosque, which is located near the city center on Karachi's main highway. It also shattered windows in a tall building opposite the mosque, leaving shards of glass on the asphalt. 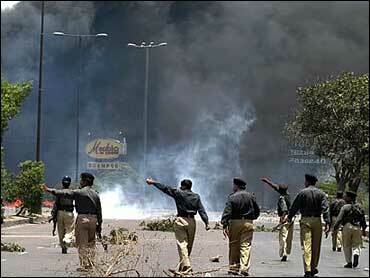 Police Chief Asad Ashraf Malik said at least 16 people were killed and 38 injured. He said a body retrieved from the scene was being examined to determine whether it was that of a suicide bomber. "We have not reached any conclusion yet," he said. An investigator at the scene also said there did not appear to be a crater, which suggested a suicide bombing. A worshipper inside the mosque, Ghulam Ali, said he thought a bomb had been thrown inside from a passing car. He described hearing a thud and seeing a speeding car drive away before the blast. The mosque then filled with smoke and people inside ran around in panic, said Ali, who was bleeding from his wounds. "I heard a big explosion, followed by flames from the front of the mosque. And I saw two injured people falling on the road, bleeding, and one had no legs," said Ghulam Hussain, a fruit vendor. Ali Abbas, a young worshipper, tried to push people out of the area, afraid an abandoned bag inside the mosque contained another bomb. Bomb disposal experts later took the bag away. Saqlain Raza, a worshipper who was parking his motorcycle outside when the blast occurred, estimated that 30-35 people were inside the mosque at the time. "One 3-year old child was bleeding from the head and stomach," he said. "I carried the boy out and a car took him to hospital." Information Minister Sheikh Rashid Ahmed said President Gen. Pervez Musharraf expressed grief over the killings and would take an "important step" in response. He did not elaborate. Karachi — Pakistan's largest city of 14 million people and the country's commercial center — has been the scene of recent sectarian violence and terrorist attacks. Those include two car bombings near the U.S. Consul's residence last week and a May 7 suicide bombing at a Shiite Muslim mosque that killed 20 people. Police have formed a special task force to investigate the slaying of Shamzai, a cleric in his 70s who had been a strong supporter of the former Taliban regime in neighboring Afghanistan and had met al-Qaida chief Osama bin Laden. Witnesses said his assassins included as many as six gunmen riding in two cars and a motorcycle. They sprayed Shamzai's car with bullets Sunday morning, killing him and wounding one of his sons, a nephew, a driver and a police bodyguard. Much of Karachi's violence is blamed on Islamic militants, angered by Musharraf's support for the U.S.-led campaign against terrorism in Afghanistan, but clashes between rival Sunni and Shiite Muslims are also common.